A new, occasional feature of my writing life. Whoa … holy stunner of a day, Batman!! 🙂 🙂 Truly a beautiful, gorgeous, incomparable day. Municipal elections (here in Ontario, Canada) yesterday. Results? Ugh. Ugh ugh ugh ugh ugh. Mostly. 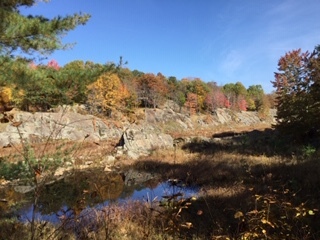 Cool rock canyon in Frontenac Park. 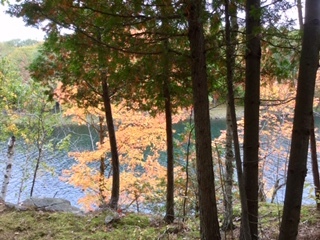 Stunning spot in Frontenac Park. Truly a wow. A wonderful walk in Frontenac Park. Stunningly beautiful, sunny, breezy day. Had a wonderful walk along the Boardwalk & out the Ashbridge’s Bay loop. Observations: Pretty hard to see what’s going on in the world if you live your life 100 miles up your own backside (or never yank your head out of your “device/s”). 10,000 years into human “civilization” - & look how very civilized we are! Uh … not. Lots of monarch butterflies again! Beautiful day, post-crazy-weather across Ontario. Tornadoes in Ottawa area (& across the river, in Quebec). 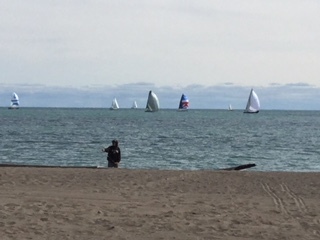 Folks having lots of fun out on the lake, & on the beach, watching the kite guy. Along the Boardwalk, Saturday, Sept. 22/18. Pretty grateful for this rich, full life I’ve led. It’s had its fair share of problems, to be sure. None of us is without challenges, hmmmm? But … I’m grateful for a great many things, I must say. Hmmm. Some days are not worth remembering. This was one of those… Some days, you just have to pull the covers up over your head & hide, hmmm? Nice day weather-wise!! Humidity vamooshed. How lovely! A great walk was had. So. Walked again. (Still humid as hell.) Realized that 2 of the main things that keep me sane (well, sort of) are my walking & gratitude habits. & I’ve let both lapse in recent months. Not a good plan!! 🙁 🙁 Time to re-jig. Especially since I consider both of these practices to be pretty much magical! Re: the nuke situation I was worrying about? More news on that front. Being spontaneous. Living in the moment. Ahhhhh. Such a good thing. p.p.s. no trails today. No trails, but lots of butterflies - monarchs, as I walked along the Boardwalk. Concerned about Hurricane Florence, & possible nuclear implications. 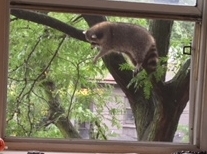 Went to the garbage/recycling bins outside, liberated a raccoon who was stuck inside one of them (the creature failed to thank me before scampering off rapidly, &, I assume, gratefully). Chemtrail assault!! Many days in a row (pre-Hurricane Florence) with not a trail to be seen. (Was all air travel suspended? Surely not??) Today?? Whoa. They’ve really gone to town today, I must say. Whoa. #thetrailsareback!